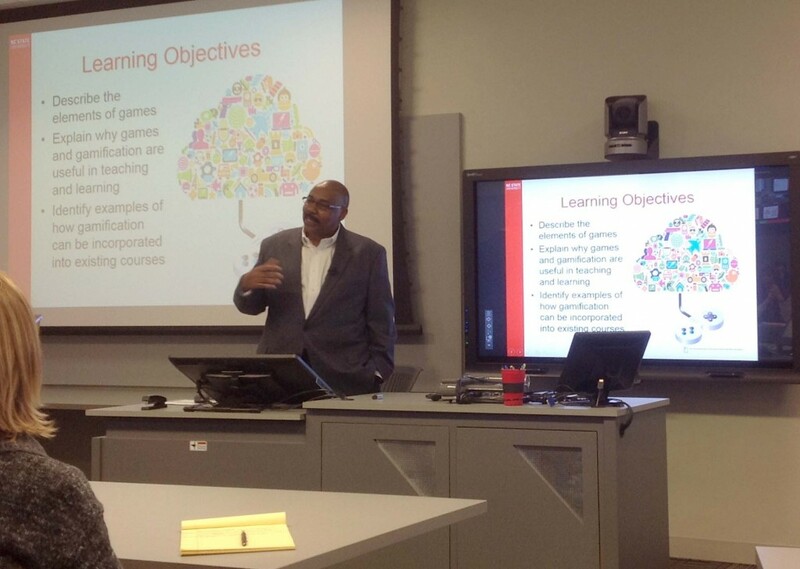 DELTA Faculty Fellow Dr. Edwin Lindsay has spent his fair share of time in classrooms at NC State. As a three-time NC State graduate, who earned a B.S. in Biological Sciences, a master’s in Parks, Recreation and Tourism Management and an Ed.D. from the College of Education, this Faculty Fellow has dedicated a significant portion of his life to the university—and he isn’t done yet. As the teaching assistant professor of PRT 266, Introduction to Sport Management, Lindsay has turned this course from its traditional ways of the past into an interactive, engaging learning experience. How? He turned it into a game. Lindsay led a discussion on February 11, 2016, in Poe Hall titled, Level Up: How Gamification Can Engage Your Students. Here he gave details on the transformation process his course went through and how gamification has affected his students and their participation. Prior to gamification, Lindsay found students somewhat disinterested in course material. In order to answer these questions, Lindsay began working with Amanda Robertson, former DELTA assistant director of educational media development, and DELTA Business and Technology Applications Analyst Stephen Bader. With the help of a team, the trio took existing course materials and completely revamped them. When they first began, the goal was to gamify one unit of the course. Lindsay recalls Robertson suggesting to convert the entire course. Lindsay has found several benefits to gamifying course material, including its appeal to a variety of learning styles, an increase in motivation among students and promotion of interactivity. It has also allowed his students in particular to make better decisions about careers. During his presentation, Lindsay focused on three main elements of games: progression, investment and cascading information theory. When students first enroll in PRT 266, they take a modified Myers-Briggs personality test. This test reveals their personality types and strengths they possess. By knowing this information, students may choose a career path that highlights their best assets. As they advance in their professions, new activities become available through activity release, a prime example of utilizing the cascading information theory. Students can earn badges for various accomplishments as well as monitor their progression through the use of a leaderboard or progress tab. The more students invest in the course, the more progress they will make. However, students still have restricted access to certain pieces of material. For example, if they do not score well enough on a quiz, they have to retake it before advancing. Bader, the team’s Moodle expert and gamification plug-in developer, also instructed Lindsay on how to use Moodle’s built-in mechanisms (activity completion and user reports) to allow course administrators to see if a student has logged in and met certain requirements. Just by logging in, a student’s progression bar can increase. Students can also receive hidden points for viewing each page of given content. These points can be attached to a game score, assignments or given as extra credit. Through this recently gamified course, students can visually monitor their progress in the class. They are also encouraged to socialize with their peers through groups. These groups serve as the socialization component of gamification and promote collaboration. It is important to mention, however, that PRT 266 is not just a distance education course. “I teach an online and seated section of the class, but Fridays are game days for both,” said Lindsay. While true DE students are enrolled online, the class still meets through Collaborate making it a “blended” course according to Lindsay. While “students are accessing [his] course more than they ever have,” Lindsay thinks it is important to work with courses individually, staying consistent with the goals and learning objectives of the course. To access more information and view live tweets from Dr. Lindsay’s presentation, visit DELTA’s Twitter account, @NCStateDELTA. NC State community may watch the presentation on Mediasite with valid unity credentials.